Posted by M Bharath Bhushan in Culture, Hyderabad, Photos, Review, Telangana. Life brings tears, smiles and memories. Tears dry, smiles fade but memories last forever. All it takes is one picture to bring back a thousand memories. The Hyderabad of yore where time stood still, where the dust of the royal past never settles. How about reliving an age gone by? Now, you can take a step back in time and enjoy a fascinating past. Aks-e-Hyderabad (Images of Hyderabad), a photo album brought out by Urdu daily Siasat , brings alive the past in minute detail. A picture is worth a thousand words. The album, with 600-odd stunning images, narrate the tale of twin cities in a telling manner. Though there is no dearth of books on Hyderabad, an album is perhaps the first of its kind. Flip through the folder, and you get the feeling of a kind of videotape playing in your mind. Striking images of Golconda, the Pearl City, the agony of the 1908 floods, modes of transportation, coins and currency, culture and civilisation, marriage, music and dance, jewellery and costume and the Nizams and their family flash by. Just about everything of the erstwhile Hyderabad is contained in 319 pages of the photo album. Posted by M Bharath Bhushan in 1969, Andhra, Andhrapreneurship, Articles, corruption, CPI, CPI-M, Culture, Deccan, English, Hyderabad, Identity, MIM, Mulki, Nizam, politics, regionalism, Review, struggle, Telangana. Greetings from the State of Telangana! I am not a journalist (exclusively) myself but, I do have high regard for true journalism and true journalists of unquestionable integrity. I hope, you subscribe to such values, too. After reading your column “Land of many discontents” though I have serious concerns. Just to be sure, I then read your other articles on Telangana and my suspicions were confirmed. Perhaps, it is unfair on my part to expect such high standards from you. Still, considering the facts that you have worked at BBC and Indian Express as a senior journalist, I expect you to at least check your facts for accuracy even if your opinions are biased. Alas, you have seriously disappointed me and, I am sure, many other serious readers of news and opinions both in India and abroad. What shocks me is that even senior journalists like you and many others like Vijay Simha @ Tehelka, and even Rajdeep Sardesai of Editors Guild take your professional responsibility rather lightly and commit grave errors both in substance and accuracy. I just wonder what the reasons could be. Is it because you consider yourself above the fray or too important to concern yourself with the mundane task of verifying facts and the veracity of your statements, or just plain carelessness and recklessness? After all, you have represented the Editor’s Guild along with Sardesai to the EC regarding how badly prevalent is Paid Journalism in Indian Press. Why then do you perpetuate the same things (paid-journalism) you complain to EC? Posted by M Bharath Bhushan in 1969, Andhrapreneurship, Congress, Economy, heritage, Hyderabad, Identity, MIM, Mulki, Nizam, politics, regionalism, Review, Settler, students, TDP, Telangana, TRS, YSR. Nag prefers to steer away from opinion and stick safely to facts. It’s a quick run-through of the issue for outsiders. As a chronicle of the ongoing Telangana agitation, Kingshuk Nag’s Battleground Telangana has much to offer: well-written, missing no issue and, more important, unemotional. Nag supports the creation of a separate Telangana state, ridicules the idea of Hyderabad city as a union territory and drives home the point that the decision to do so should be taken now. He takes us through the unhappy creation of Andhra Pradesh from the coastal Andhra and Rayalaseema regions of erstwhile Madras State and Telangana, the resentment of the people of Telangana that led to the first agitation in 1969, the state through NTR, Chandrababu Naidu and Y.S. Rajasekhara Reddy, and the movement since 2009. Aware that Telangana is an emotive issue, Nag steers away from opinion and sticks safely to facts. It’s a quick run-through of the issue for outsiders. Nag isn’t always objective; taking cheap swipes at the Nizam and Chandrasekhar Rao, missing the subtleties of a difficult issue. Posted by M Bharath Bhushan in 1969, agitation, Art, cinema, Congress, Culture, Deccan, Economy, elections, Fazal Ali Commission, Hyderabad, Identity, Kakatiya, Karimnagar, movement, Mulki, Polavaram, politics, Rayalaseema, regionalism, Review, Settler, Six Point Formula, Sonia, TDP, Telangana, Telugu, TRS, universities, violence, YSR. Telangana is victim of its own leaders who permitted others to exploit it. These leaders are culpable for two reasons : either they are guilty of not knowing the diversion of water, funds and other resources; or they knew it but allowed the injustice to continue without any resistance. For the sin of leaders, people are suffering. It can also be said other way round too : people should have been more conscious to question these leaders and not allowed the leaders to exploit them. Andhra Pradesh unfortunately did not have a leader of state level nature so far. Almost all chief ministers conducted themselves as the leaders of their native district or region and none ruled like a leader of the entire state. Some of the leaders did not do anything for their district or region. People’s representatives who occupied crucial positions in New Delhi were more obedient to Prime Ministers and thus never cared for their state. Some MPs and bureaucrats from Coastal Andhra were over smart and diverted the resources from out of Telangana. This led to serious disparities among the region’s leading to the present state of hostilities and turbulence. Posted by Telangana Utsav in 1969, agitation, Andhra, Congress, elections, Hyderabad, Identity, Mulki, Naxalite, politics, Rayalaseema, regionalism, Review, Sonia, Telangana, Telugu, TRS. Google Telangana and you are likely to find more books on the communist-inspired “struggle” of the 1940s and 1950s than the “separatist” agitation of 1969-70 or the one in progress. While there is no link at all between the “struggle” and the “agitations”, it is becoming increasingly clear that Telangana’s Maoists hope to climb on the separatist bandwagon to further their own cause. 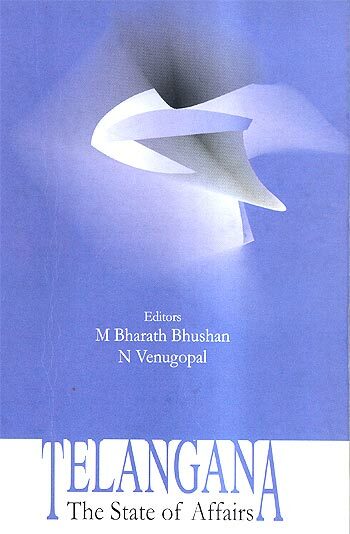 So, it is not surprising that both M Bharath Bhushan and N Venugopal — editors of this slim and eclectic collection of essays on various facets of Telangana life, culture, politics and economics — labour hard to link the two and, in the process, denounce the mainstream separatist leadership. 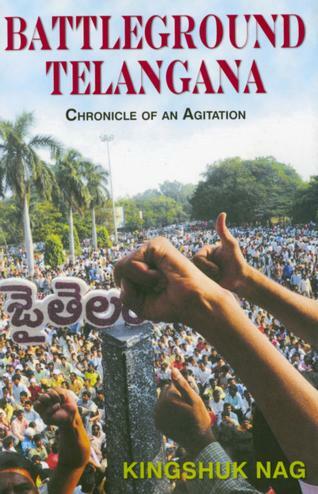 The context of the book is clear — the editors clearly felt an year ago that the Telangana agitation was sagging, which it was as evidenced by the results of the 2009 elections, and so chose to once again highlight the issue. 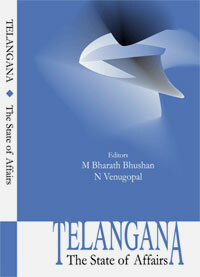 The sub-text of the book seems to be to offer a “left of centre” critique of the Telangana Rashtra Samiti (TRS). Bharath Bhushan not only offers a bizarre theory linking the “separate Telangana agitation” to the “Telangana armed revolt” led by the communists, but also accuses the TRS of not leading a “people’s movement” but one of “elites”.